assessment program. It helps students prepare for class and instructor gauge individual and class performance. Explore Concepts and Current Events–Includes a balanced survey of security, economic, and transnational issues. Improve Critical Thinking–Feature boxes help students apply international relations theory to current world problems. Engage Students–A four-color design and numerous figures, maps, and photos offer a current and lively reading experience. Emphasize Learning Outcomes–In MyPoliSciLab, study plans based on book-specific learning objectives give students follow-up reading, video, and multimedia activities for further practice. Support Instructors–A full set of supplements, including MyPoliSciLab, provides instructors with all the resources and support they need. 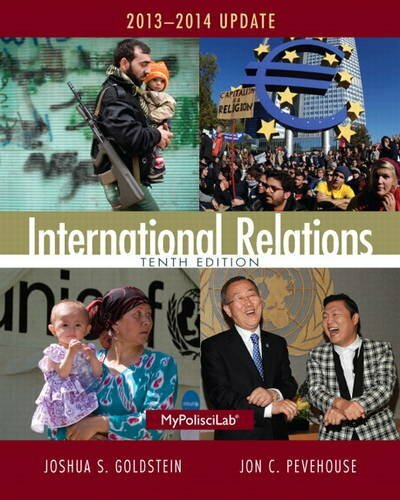 0205972152 / 9780205972159 International Relations: 2013-2014 Update Plus New MyPoliSciLab with eText -- Access Card Package, 10/e Package consists of: 0205949975 / 9780205949977 NEW MyPoliSciLab with Pearson eText -- Valuepack Access Card 0205971369 / 9780205971367 International Relations, 2013-2014 Update NOTE: MyPoliSciLab does not come automatically packaged with this text. Joshua S. Goldstein, is an associate of the Watson Institute for International Studies at Brown University and a leading expert on war. His books include International Relations and War and Gender: How Gender Shapes the War System and Vice Versa. He lives in Amherst, MA. Difference Feminism versus Liberal Feminism?